Cab is together and playable. Art turned out better than I could have hoped for! Still lots of configuring to do but I've got the front end set up (Launchbox) LED blinky is working well enough to light up the buttons that are used for each game in MAME, and the Servostiks are automatically changing from 4-8 way based on game. Thank you to the entire forum, this place is a wealth of knowledge. And thank you to GameOnGrafix who took a look at my final art, suggested some changes/pointed out some issues, and eased my concerns about the art not printing properly. Super excited to be making this thread. After many years of lurking and random posting in this forum, I finally bought some MDF tonight and am actually starting a cabinet build. So here is my project thread. I posted another thread in Main recently with some grid paper cab plans which were met with much criticism. 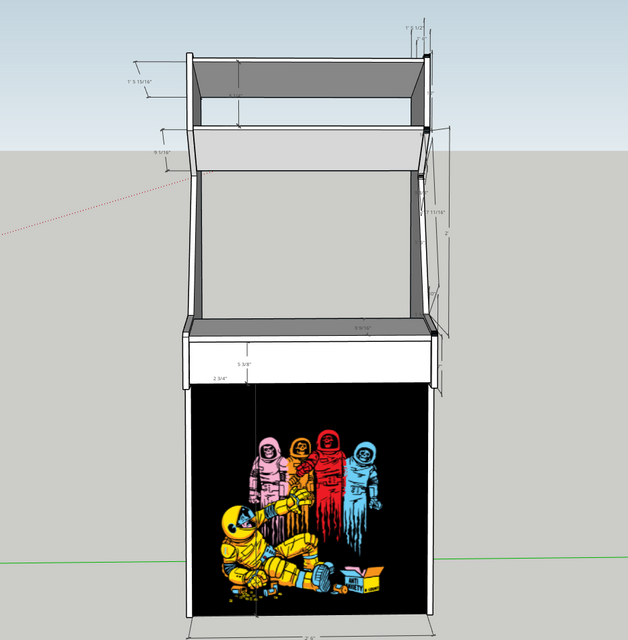 Since then, I have managed to fumble my way through Sketchup and made a model of my cab(after several revisions). I know this will rub many purists the wrong way but here's my plans and model. 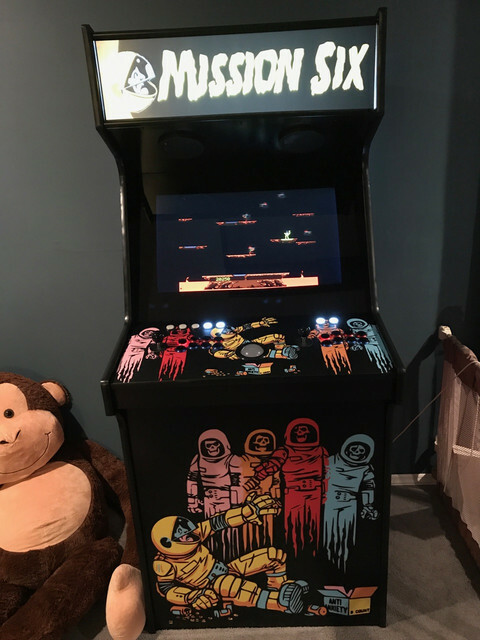 Full size, 2 player cabinet. 1 U Track track ball w/led add on Ditching the LED due to cost. Not sure how many admin buttons - coin up, p1 start, p2 start, pause, fast forward, exit, - Will probably hide fast forward on the top of the cabinet. Emultators will be MAME of course. Need to research any other arcade emulators that run games that MAME doesn't or runs them significantly better. For giggles, I may put NES, Genesis, and possibly SNES. Will have Steam games also for recent fighters, MK SF etc., random shmups like Jamestown, Cuphead and anything else that might lend itself to a cabinet. Not sure if these have any games that I want that run better than MAME - research required. The artwork is going to be my biggest challenge. I really have no idea how to use Inkscape or other graphic programs but I'm going to give it my best. I may end up having to break down and pay for art but I've almost busted my budget already. I'm hoping to use "The Madness of Mission 6" artwork posted below. Want to do "Mission Six" text for the marquee but not really sure how to pretty it up beyond that(Maybe an Atari logo in the background?). CP will probably be the full artwork. I want to use the red ghost on one side panel and the blue ghost on the other side. Not sure at all on the color scheme other than that. I've lurked for a long time and I have learned a lot through the years but I know its going to be different putting all of this in practice. I'm going to have lots of questions and I appreciate any advice I can get from anyone. Anyway, here's my cab and the pic I want pull my art from. Cool theme. Not sure you need 7 buttons. Also, look into Servostiks for your joys. Would make switching easier. Pay someone to do the art. In the grand scheme of things it's not that expensive and if you've really lurked here for that long... make this something that you'll be proud to look at / show off / play. Doing 7 buttons for a Street Fighter/NeoGeo layout like below. Though I just started thinking, "how many NeoGeo games actually use 4 buttons". Any other games other than NeoGeos that use 4 in a row? Also, have thought about the Servo Stick but it just seems like 1 more thing to break. I've got a 7 year old that'll be playing on this plus his friends. I hate to think what them yanking on a stick while it switches modes might do to the servo. Yea I definitely want it to look good. Gonna give it a shot myself, at least to get a basic concept I think. If you are going to go flat screen... do yourself and everyone else that plays it a favour and get a Freesync/G-sync monitor. This way with a compatible graphics card you won't get any stutter or tearing associated with fixed refresh LCDs. The games will run in their native refresh rate. I've got Mag-Stick Pluses on my cab. It's real easy to switch between 4/8 way...just simply pull up and turn. Also. If you are planning to play newer fighting games (mainly the Injustice series) you might want to add an 8th button. The kids don't need to know which games are 4 way and which are 8. They'll just be happy to play lol. I'm a child of the 80s, I've got a pretty good idea on what's 4 way. And not like I couldn't just switch it while in game if I didn't know ahead of time. Almost definitely going with the MagStik Plus even though there is no LED version. Would love to get some thoughts on these. Very rough and need a lot of work but how does the general concept work??? Trying to decide if this idea is even worth pursuing. I may skip the front art and just do a coin door, not sure yet. I have some experience with Illustrator. I am no artist but I can split up and modify existing art. Let me know if I can help. As for figuring out how many buttons and what controls you need, I've been working on a little side project. It's not done, but it works. Paste in your list of roms (the filenames without .zip), click "add cab" configure it, hit "Refresh". You can click names in the resulting list to see requirements for the game. 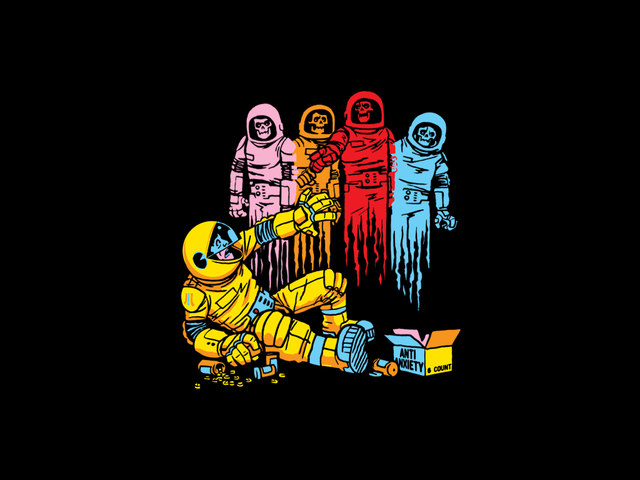 I had a chance to chat with the original artist, Travis Pitts, who made this image for threadless. Really nice guy and also an enthusiast of the classic games. I think you’re on the right track, but I would definitely get a coin door, but I’d do simple graphics around it. Are you planning to vectorize the art so it upscales well? If so, you could edit the shape of the ghosts to better fit the sides. Also, I’d fit 2 on each side instead of the one per. It’ll add more interesting colours to the sides instead of being only 2-toned, and add a bit more visual “weight” to the sides rather than just one character silhouette. If you are going to do simple artwork like that you should stencil it with paint instead of printing it on vinyl. That would be sweet. I am not implying any negative connotation with my use of the word "simple". I think it would look badass painted. I'm mostly just fumbling my way through InkScape and Gimp. Lots of Googling, very little progress. I'd love to know a quick way to separate all the elements from each other, each ghost, the man, the pill bottles, the box, the pills. I'm open to any suggestions. I was not blessed with an artists eye or hand. I've loved the art and the story behind it since I first saw it. Bought the t-shirt and it's so worn out I really need to order another one. I previously tried to reach out to Travis Pitts to get his blessing to use his art but had no success getting in touch with him. I figure no harm/no foul since it's just a personal use thing. I know you're a big artist around here and know what you're talking about so I'm glad you say I'm on the right track. For vectoring, I'm going to do the whole image all together. Then I'm going to go back to the original image and pull apart each element, each ghost, the guy, etc... and then vectorize each of those independently. How on earth do I even begin modifying the shapes of the ghosts? Do I do that before vectoring? I'm guessing that would require an artists touch which I'm sorely lacking. 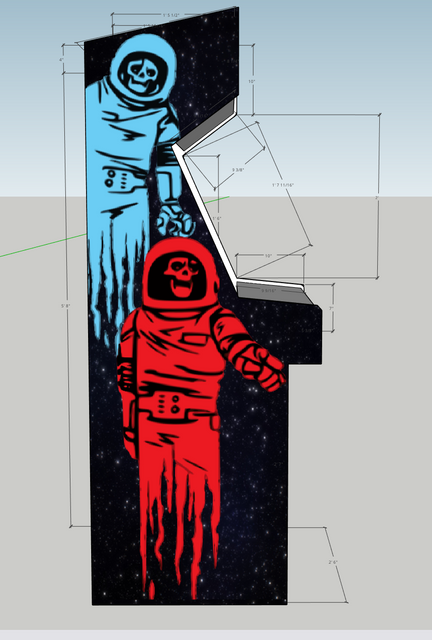 Definitely agree with adding 2 ghosts but then I have to scale them down quite a bit to make them fit, right? That's gonna leave me with a lot of blank space. Unless I stretched them taller but I think stretching them would make it look weird, wouldn't it??? 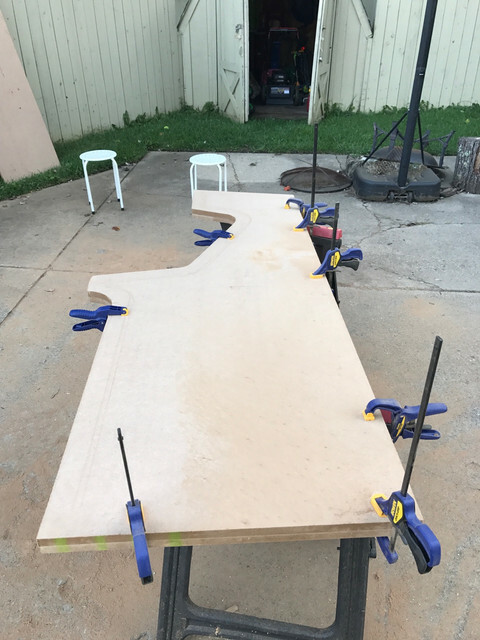 I was hoping to put saw to wood this weekend but someone pointed out that my control panel was to low at 36" so I'm going to do another round of Sketchup I think. CP will slope from 38" in the front to 40" in the back. 10" deep. Thoughts? 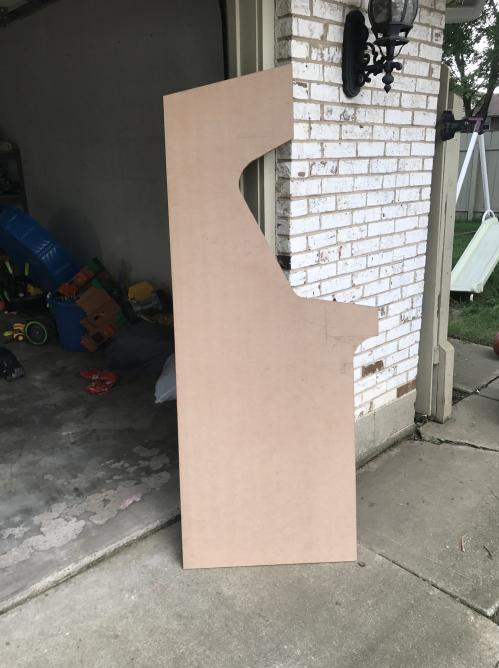 How does one even go about getting a stencil(s) big enough to fit an arcade cab. I definitely couldn't free hand it. Also not sure how well it would turn out. There is a good amount of shading in there. Okay, modified my plans to raise the control panel. More work on the art. Still trying to get a feel for it. No idea what to do in the empty space. Mike is totally not trolling, and I think that’s a fantastic idea. 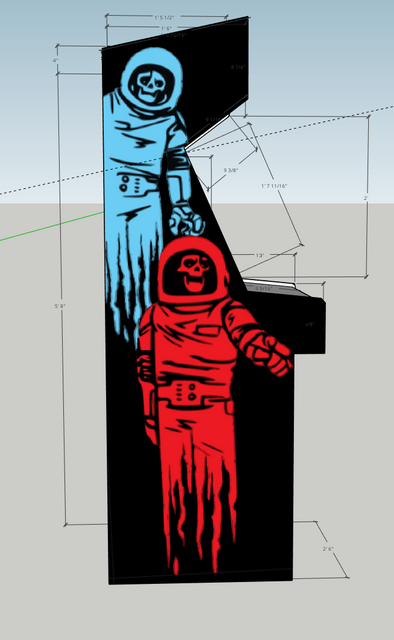 Stenciling this would be pretty straight forward as it’s one colour per ghost. I would consider that option. It would add a professional level to your project and will look more legit to the way cabs were BITD. I stenciled 3-coloured artwork for one of my projects, and it turned out really great looking and made the cab seem more pro. Took longer to do, but it was worth it. Also, graph paper is your friend here. 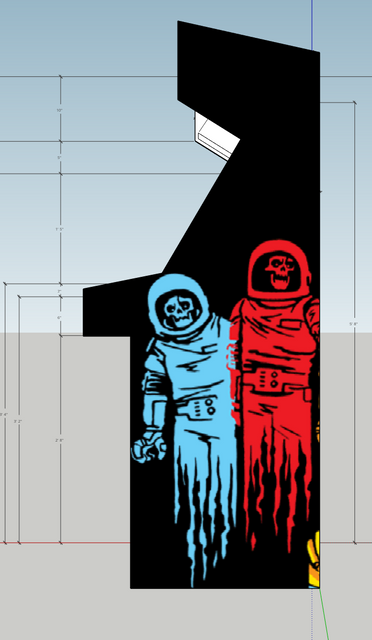 But if you choose to go the vector/print route, yeah, vector the image but make sure to have each ghost’s vector shape in their own folder/layer. That way you can edit them individually and add any missing elements to them. As for fitting, you could have 2 of them on each side, positioned in front of the other, but the back one slightly smaller and higher in vertical positioning, as if in a cascade arrangement with a slight amount of perspective scaling. This way you could keep them slightly big but still fit both on each side while not leaving too much empty space. Mind, it’s not a bad thing to have empty areas, as long as the “positive and negative space” is somewhat balanced. Guess my next step is to split everything up and then vectorize. The stencil idea sounds cool but I have no idea how I would even begin something like that. If you are handy with a sharp knife or a scalpel and are willing to do a bit of work, you can use frog tape, a scalpel, a printed template and, of course, paint. So yep, stencils can look good. Those look amazing but there's no way I have the skill or patience to do it correctly. Think I'll stick with vinyl for this one. The monitor area was REALLY hard to cut. Couldn't get my circular saw in there because of the angles. Went in with a jigsaw and screwed up the edge really bad. Basically lost my clean 90 degree edge. Had to go back in with the jigsaw and cut the monitor area deeper into the cab than I wanted to fix the edges. Hoping a little sanding gets it closer to perfect. Would LOVE any tips on sanding the edges without rounding them! Took a lot longer than I expected to just get this done. Next step is rough cutting the other panel and then routing it using this one as a template. That is such an obviously simple solution that I NEVER would have thought of. Get that first side all cleaned up - making the second side from the first is pretty simple. I have a few other pattern routing images in here too.. I finally had some free time and some good weather to work on this some more. 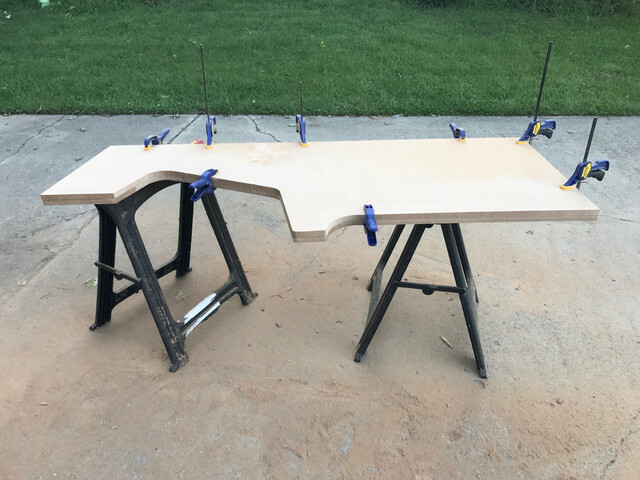 I wasn't happy with the side panel I cut last weekend so I decided to scrap it and start over. Pretty much ditched the jigsaw entirely this time and just used my router and a Dremel with attachments to cut the curves, along with a circular saw. The Dremel held up really well by doing shallow, progressively deeper passes. I managed to get a new panel cut out. I'm pretty happy with it and I used a flush cut bit with my router to make a matching panel. Some light sanding to do tomorrow and then it's on to the middle pieces. Hope I have enough MDF. I bought 2 3/4" sheets and have used one and a half so far(other than some usable scrap pieces). I've also got a 1/2" sheet that I may use for some pieces if I don't have enough 3/4". Also got my monitor today. Decided against the 32" LCD and went with a 27" so the cabinet wont be as wide. No time to work on the cab this last week. Working way to many hours and headed out of town for the weekend with my wife for an anniversary weekend. 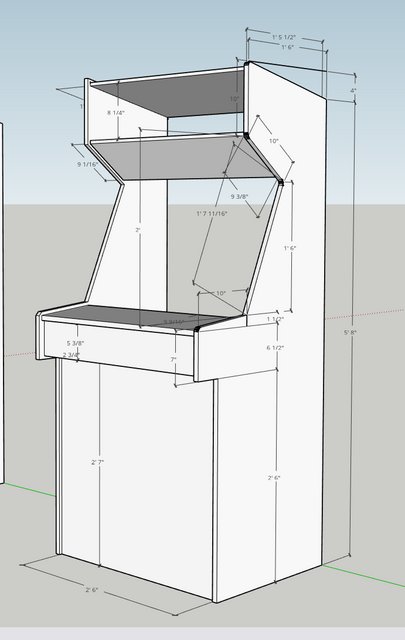 Still trying to decide the final width of the cabinet. Wavering between 27 and 30 inches. Messed with the art a little more but it's slow going. I had all the elements separated from the original artwork but removed all the black from inside the ghosts. Didn't like how that looked so pretty much back to square one on the artwork. Also considering other themes now. Cup Head, Street Fighter, Mortal Kombat or a shump theme like the Raiden or DonPachi series. Just want to have something that looks "WOW" and I'm not sure I can pull that off myself. If any artists are interested in giving me a ballpark on what they would charge to work with me on this, please let me know here or in a PM. Definitely starting to think the quality of artwork I want is well beyond my abilities. Cuphead is great. Plays really well with my fightstick and definitely could have been an arcade game back in the glory days. I get that the game was WAY over hyped because of the graphics but at it's core, it's a fun shoot em up and you have to admit the graphics ARE pretty cool. I know Cuphead cabs have been done before but I've never been much of an idea man. Just want the cab to look slick. 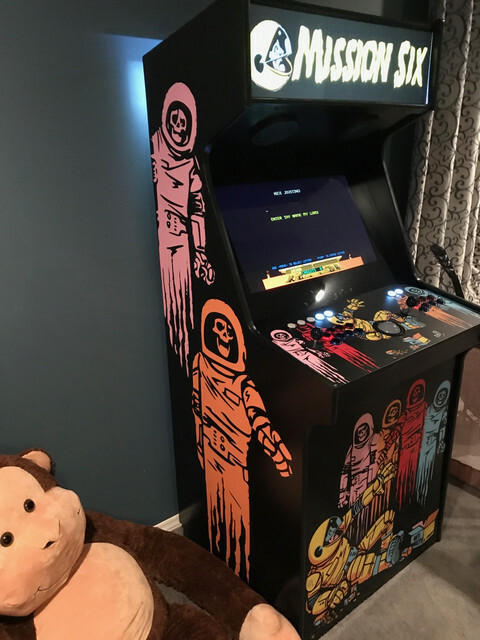 I REALLY wanted to do a zombie theme, "Undead Arcade" or "Arcade of the Dead", but I've got small kids and don't want them to be afraid of the cabinet. Don't put the word arcade in the name. I have no artistic ability (at least working with a computer) but the artist I hired from deviantart for my recent project was awesome to work with and prices were reasonable, IMO. I don't do art commissions for members here anymore, but depending on how many pieces you're going for (marquee, side, cp, etc..) and the complexity of the images an artist could charge you anywhere between $200-600. This is if you're going for totally original artwork, and not photochopped images from official art. It really all depends on how the artist breaks down the workload. Character collages are a PITA and when I was doing art commissions for people, I'd warn them ahead of time that it would be costly. I'm really hoping to make this Mission Six art work. Going to keep plugging away at it. Any feedback from you as I come up with stuff would be hugely appreciated. Might ultimately end up hiring someone but I would love to be able to do the whole thing myself. Just make up your mind what you want as a theme. I am sure you will pull off something nice with some help from folks here. There are quite a few build threads with a 32" and it's a great size for a modern cabinet. I just finished my CP and I chose 7 buttons for my p1/p2. I used the slagcoin Japanese layouts and added an extra button to the bottom row. My main reason for doing this was to match the 4 buttons I'm using for my 3rd and 4th player layouts. If you're only crafting a two-player machine, you're probably fine with 6. The retro aesthetic looks fantastic. Very clean design and era-appropriate! Not much to add so far. Updated my first post with a few changes. Been busy at work so haven't had any time to work on the cab lately. Had a little time today so I cut some furring strips and cut out my CP. Screwed up my half inch sheet of MDF. I suddenly cant cut straight with a circular saw + guide. It was a pain to get my circular saw clamped down squarely into the guide plate but I finally managed. Did a quick test with it on a piece of scrap and it worked really well. Pretty much idiot proof. Hope to have more time to work on this tomorrow. Maybe get the furring strips attached and the rest of the panels cut. Considering having gameongraphix modify art from The Simpsons to fit my cab if I can't work out my own art. Also realized the 2 old PCs I had laying around that I was considering using are both dead. Can't even get them to POST and they aren't worth wasting more time on. Gonna buy a new CPU, Ram and mobo for my main desktop and then use the old parts for my cab. 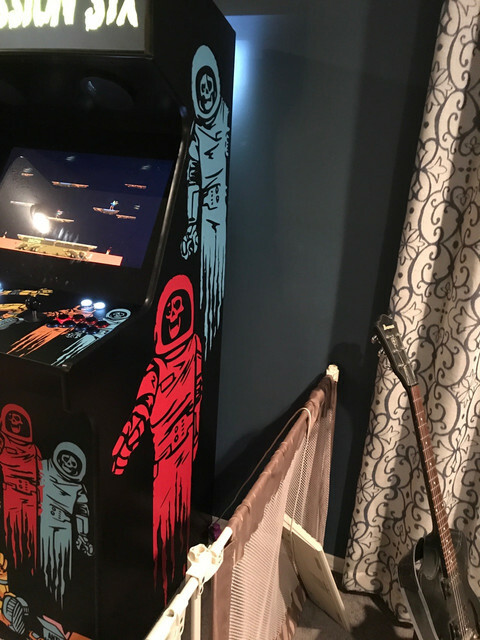 Mame cab will have a 4th gen i5, and 16 gb ram. Have an old power supply and a gtx 970 to put in also. Way overkill but should run modern games really well. Alternatively I may see what I can get for the 970 and just use an old 550ti I have laying around. I managed to find some time the past week and got ALL my panels cut!!! Pretty excited!!! I cant say enough about the Bora Clamp and Saw Plate. I was able to rip long cuts and square up panels with ease. Was just tinkering with the art some more. Would love some thoughts and opinions on this? 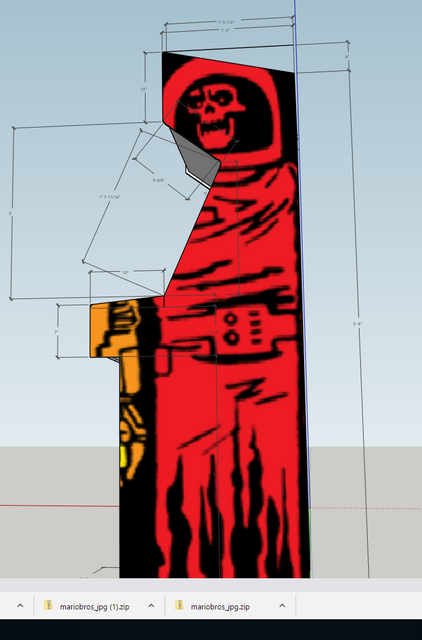 If I fail at my own art, I'm going to just have The Simpsons side art printed at the size I need and go with that.